This morning is our first in the 30’s at the house (39º outside; 57º in). Yesterday we went up to the White Mountains to do some hiking. It was brisk, breezy, mostly-sunny weather, and the whole region was overrun with summer-dressed foliage-tourists bearing Massachusetts, Connecticut and New York license plates. None of them saw any snow or ice from the roadside viewpoints. 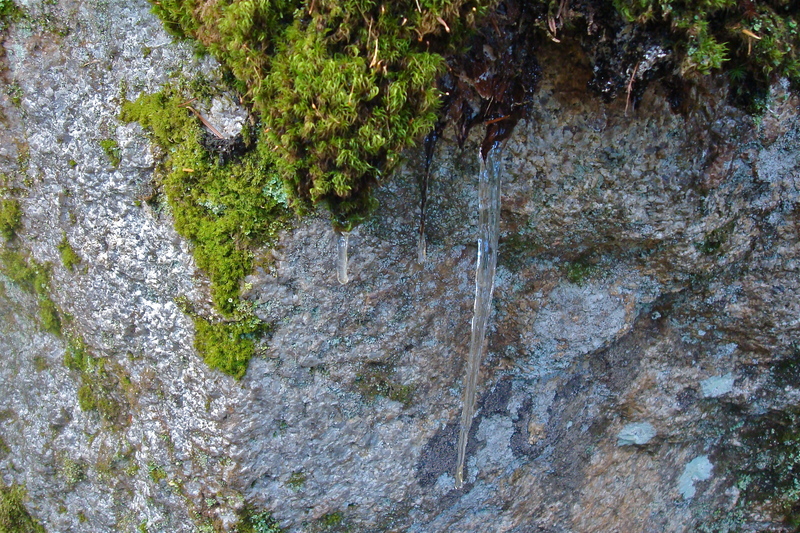 But up above 4,000 feet, just below the densely shaded summit of South Hancock Mtn, in the late afternoon, hanging from a grotto of thick moss on the north facing side, I spied the first icicle of the season… the sole first harbinger specimen of an fang-toothed exotic species which will, before we know it, incubate by the millions in our midst, and, within two short months, completely overrun this part of the world. This entry was posted on October 10, 2010 at 7:07 am and is filed under Uncategorized. You can follow any responses to this entry through the RSS 2.0 feed. You can leave a response, or trackback from your own site. Wow. Only one degree away from ignition. Holy crap, didn’t y’all just thaw out? It’s back?